I know that increasing the length of the string will decrease the pitch, but that doesn't explain why the body of a cello is larger than a violin, only longer. What would be the "problem" with having a violin with a really long neck so it's the length of cello, and putting cello strings on it. Is there some physical issue with trying to achieve a low pitch in a small resonating body (or visa versa)? Some of the answers seem to be saying that you want the body to resonate at the frequency of the sound so as to produce the maximum amplitude of sound. That's not quite right. The graph below shows a measurement of the resonance curve of a 1713 Stradivarius violin (redrawn by me from a figure by Carleen Hutchins). There are a number of different resonance peaks, some strong and some weak; the ones near 200 and 400 Hz are vibrations of the wood, and the one near 300 Hz is a resonance of the air moving in and out through the f-holes. The white lines show the fundamental frequencies of the four strings. So you can see that there certainly are peaks, which indicate resonances, but they're rather narrow and there are a lot of them. From what little I understand of violin acoustics, the effect on the sound is complicated, and has to do with the way the different harmonics coincide with the many different resonances. When you play with vibrato, you're sliding the harmonics back and forth over these resonance peaks. In any case, this is definitely not a situation where the fundamental frequency of the note simply matches the resonance frequency of the body and/or air cavity. In other words, why can't we have a double bass with a soundboard the size of a violin? The answer really has less to do with resonance of the body than with the size of the body in relation to the size of the sound waves. 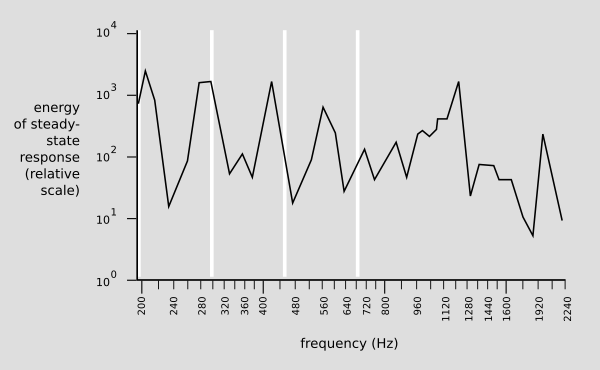 Each of the resonance peaks in the graph above corresponds to some pattern of vibration of the soundboard. 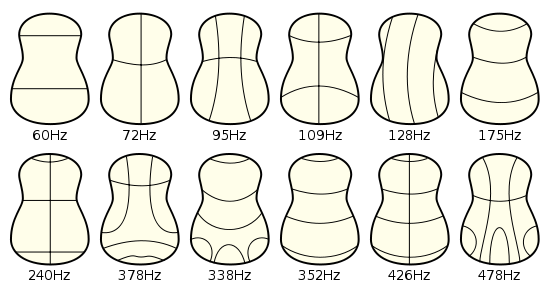 Below are some diagrams from WP of the patterns of vibration of a guitar's soundboard. The crucial point here is that in all of these patterns, there are some areas that are rising while others are falling. That is, different parts of the soundboard have different phases. Now the lowest note you can play on a double bass is 41 Hz, which corresponds to a wavelength of 800 cm. Suppose you tried to produce this sound using a soundboard the size of a violin, where the different vibrating patches were only 5-10 cm in size. Then for any patch that was vibrating outward, trying to produce an overpressure in the air, there would be another patch right nearby that was simultaneously vibrating inward, trying to produce an underpressure. They not cooperating. They will come very close to canceling out. Let's refer to the patch that's trying to produce an overpressure as +, and the other as -. Ideally you would like the the + patch and the - patch to be 400 cm apart. This would be half a wavelength, and then the + and - would actually be cooperating on producing the same 800 cm sine wave: one would be producing the crest, while the other produced the trough. In reality, the size of a double bass's soundboard is somewhere in between these two extremes. Because it's pretty small compared to most of the wavelengths it plays, there is a lot of cancellation going on, and not much cooperation. However, the cancellation is not perfect, so you do get some sound. The instrument could be made louder by making it bigger, but that would be impractical. The lower the sound the instrument is producing, the larger the vibrating plate needs to be to produce that sound. The vibrations from the strings are being transferred to to the face of the instrument by the bridge, and the face of the instrument vibrates in response, making the air move, producing the waves that we hear as sound. The larger face plate also increases the volume of the lower sound. If you had a cello with a violin sized body, you wouldn't hear the instrument very well, and the low notes would sound very "weak" and "thin". As another example, an imperfect analogy would be the game of skip-rope, where two people swing a rope between them so someone may jump the rope. A very long rope requires more energy to swing and makes a slower and larger rotation, where a short rope can be swung more quickly. The depth of the instrument body also helps reinforce the reproduction of lower frequencies due to resonance. Low frequency resonance occurs with the coupled motion of the top plate, the back plate and the enclosed air, so for good low frequency resonance, the cello body needs to be deep as well as large. Just to complement Alphonso's answer: the lower the pitch, the lower the frequency. The lower the frequency, the larger the wavelength. Surfaces respond better to waves, when their wavelength is close to the size of the surface. Imagine you try to shake a sheet of paper, by holding it vertically. There is a minimum frequency you need to apply to make it undulate. Now, if you try to apply this same frequency to a post-it, it won't shake, just move along with your hand. To make it undulate you would need to shake it much faster (higher frequency, smaller wavelength), because the post-it is smaller then a sheet of paper. Also, if you take a meter long sheet of paper and shake it that fast, it won't undulate a lot too. You would probably see the waves fading out through the paper, while it's other end barely moves. There is of course a lower frequency that would make it undulate entirely. Instruments function in a similar way. The string has to shake the body, to produce a louder sound, and therefore the body size must minimally match the wavelength of the sound waves you want to produce. You are only partly correct. For a given tension a string's fundamental resonant frequency scales with length. However, to within mechanical and material limits, you can increase or decrease tension on a fixed-length string to achieve any resonant frequency desired. The string on a musical instrument is analogous to the oscillator in an electronic audio generator: it produces the source frequency(ies). The bridge and body of the instrument are analogous to the amplifier, transferring the energy from the string to the atmosphere with (one hopes!) minimal impedance mismatch (and yes, there is such a thing as acoustic impedance in air) so as to maximize the sound volume. While each answer explains the physical properties and their relationship to the pitches being produced by the instrument, I'm inclined to add the aspect of the volume of air contained inside the instrument that resonates to amplify the sound the strings are producing. Larger volumes of air will resonate at lower pitches and increase the level of the sound being produced by the strings. The notes on a violin only require a sound box internal volume to resonate at a relatively high pitch, whereas a cello or bass needs a considerably larger sound box that will resonate at lower pitches in order to effectively amplify the sound being produced. Not the answer you're looking for? Browse other questions tagged theory learning strings instruments string-instruments or ask your own question. 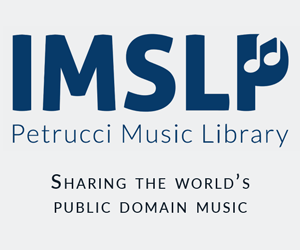 Can you multitrack a string quartet to sound like a much larger string section? Why don't “classical” stringed instruments mark their note positions?